France produces almost 400 different varieties of cheese, each one is as distinctive as a finger print. This wide selection — more than any other country has to offer — includes cheeses made from cow’s, ewe’s or goat’s milk, or in combination. Each region has its specialty — Normandy, France’s kingdom of milk and cream, is famous for unctuous Camembert and Pont l’Ev que; the Loire Valley and Provence for the tangy goat’s milk cheeses; Alsace for robust Munster; the Alpine region for firmer, subtly-flavored cheeses, such as Reblochon and Beaumont; the Paris area for the world’s most prestigious cheese, Brie — even from the Pyr n es comes Chiberta, firm, slightly nutty- flavored, a specialty of which the hardy Basque people are proud. Each region’s specialty is made according to tradition which has existed for centuries. The professional cheese- maker learns his craft as painstakingly as an attorney the law. France’s reputation for being a paradise for cheese lovers is well-deserved. Today, Americans are fortunate because they need no longer be on the original spot to relish their favorites — they can readily find them at local cheese retailers. . . almost 100 different varieties. Store such as Whole Foods Markets have great selections. You may enter Good Cooking's Cheese Shop and purchase any one of 60 plus French Cheeses from the French Cheese Selections. Cantal is one of the oldest French Cheeses, predating both Roquefort (11th Century) and Livarot (13th Century). Double and triple creme cheeses, what Americans call cream cheese is a very distant relative to these rich, creamy, fresh cheeses from France. They vary in texture from thick, heavy sour or fresh cream, to semi-firm cream. All are delicate with a refreshing tang. Many varieties are blended with a mixture of herbs and garlic or spices, such as pepper. According to French law these cheeses are classified double creme when they contain a minimum of 60 per cent butter fat (rnati re grasse) per gram, and triple creme when they contain a minimum of 75 per cent butter fat per gram. These cremes are delightful at any time of day, for any menu or snack. Simply spread on crusty French bread, per haps serve with fresh fruits in season (not citrus). Fruity wines are ideal to accompany these cheeses, particularly ros . Many Americans enjoy the herbed or peppered versions of these cheeses at the cocktail hour. Bell toile _ A soft-ripened triple creme, with no rind, it is easily spreadable. It comes as 5-oz. round, plain or herb-flavored. Boursault _ Another triple creme, soft-ripened cheese available in an 8-oz. round. This cheese is very creamy almost like a mixture of Brie and heavy cream. Boursin _ A fresh cow’s milk, double creme, white with an edible crust. It has a tangy flavor and is available with herbs or pepper. Brillat-Savarin _ From Normandy, this triple creme is a thick, plump, white disk, with a buttery texture and elasticity. Excelsior _ Similar to Boursin and Boursault, without spices or herbs. Contains 72 percent butter fat and comes in an 8-oz. cylinder. Fromage de Monsieur Fromage _ A small round, double creme, first made in Normandy about 75 years ago. Gervais _ Usually packaged in squares or rectangles. Its texture is similar to that of American-type cream cheese, but its flavor is richer and slightly tangy. La Bouille _ This rich, triple creme is not flavored, but has its own special tang. The 1 l-oz. round is available in a wood-chip basket. La Bourse _ This is a triple creme , flavored with herbs and garlic. It is round and available either in 2’/2- oz. or 5-oz. portions. Margotin _ This creme is a mixture of cow’s and goat’s milk, which makes it a less fatty, drier cheese. It is either flavored with herbs or with pepper. Petit Suisse _ One of France’s most popular double cremes, this cheese may contain from 60 to 75 per cent butter fat. Available in l-oz. plastic cups. Provencal _ Another triple creme , available as a 5-oz. round cheese in a cardboard box. It is flavored either with herbs and garlic or with pepper. Tartare _ This fresh, very creamy triple creme is only available flavored with herbs and garlic. These exquisite cheeses are the result of French cheese-making genius. They are known as soft paste cheeses, usually having a white powdery crust which, when ripened, is tinged reddish brown and the center is soft to the touch. Inside, the cheese is golden yellow, creamy, buttery smooth and “runny”. Once the crust is cut, the cheese ceases to ripen. As with all French cheeses, this type must be served at room temperature. Again serve them with crusty French bread, apples, grapes, peaches or pears, and for most of them a light to medium French red wine makes an ideal accompaniment. Bibress _ A cylinder-shaped creamy cheese with a flavor similar to a mild blue cheese. Brie _ The “King” of soft-ripened cheeses. Its powdery, white edible crust becomes tinged reddish brown when the cheese is fully ripened. As with each of this type of cheese, it reaches its peak at room temperature. Brie de Meaux _ One of the original, authentic Brie cheeses, named after the city in which it is made. Brie de Melun _ Another authentic variety of this famous cheese, also named after the city where it is made. Bache Lorraine _ Similar to Brie in texture and flavor, is available in the shape of a log. Cambree _ This newcomer is a combination of Brie and Camembert, with 50 percent butter fat. It comes in a rectangular loaf which weighs six pounds. Camembert _ One of France’s most popular cheeses of this variety, known and admired throughout the world. Available in an 8-oz. round, it is an original specialty of the province of Normandy. Caprice des Dieux _ An oval-shaped cheese, slightly creamier than Camembert with an edible crust. Carre de l’Est _ A square-shaped cheese, similar in flavor to Brie, but milder. As with most of this variety, the crust is edible. Chaource _ A specialty of Champagne country, this cheese is creamy, plump and round in shape. Its white crust is edible. Coulommiers _ Made in the same region as Brie, it is smaller in size, plumper than its cousin, but similar in flavor and texture. Fol Amour _ An oval-shaped cheese, made in the north of France, and similar to Brie in flavor and texture. St. Benoit _ A specialty of the area of Orleans, it is made from skimmed cow’s milk and is in the shape of a small, thick disk. Inside it is ivory-colored and very creamy. Valdieue _ This cheese is a close cousin to Carr de l'Est, in shape, size and flavor. Valmeuse _ This is again in the Brie family, but it contains a special stabilizer to retard ammoniation. These are cheeses which are semi-firm to the touch, with a smooth, buttery texture inside that yields on finger pressure, or when cut with a knife. They are mild in flavor with a clean, fresh tang to them that varies in strength depending on the age. Because they slice easily (especially when the knife blade has been dipped in very hot water), they have good melting qualities and are often used in cooking. But they are excellent as well for snacks, dessert courses with bread and fruit and a modest French red wine. Most semi-soft cheeses have an inedible crust. Babybeh _ Made from cow’s milk, this cheese is firm in texture and retains its freshness because it is enveloped in a red parrafin wrapper. It has a slightly nutty flavor. Bonbel _ Also made from cow’s milk, this is firm in texture and has a yellow paraffin wrapper. Slightly larger than its cousin, is Babybel, this cheese, too is slightly nutty in flavor. Chiberta _ A specialty of the Basque country, in the south of France, this cheese is made from cow’s milk, is ivory-colored on the inside with tiny holes. It is avail able in a four-pound round and has a dark orange inedible crust. Livarot _ A famous specialty of the province of Normandy, this is a round cheese with a strong and piquant flavor. Edam Francais _ Rich orange in color with a red rind and a distinct nutty flavor. Munster _ From the province of Alsace, this cheese has a strong aroma but is milder in taste. Square-shaped and rather orangey in color, it is sometimes flavored with cumin or caraway. Pont l’Eveque _ Again a Norman specialty, the name of the cheese means Bishop’s Bridge. It is square shaped with impressions on its usually edible rind which result from the straw on which it is ripened. Entrammes _ This popular cheese comes in a four-pound round with an inedible orange rind. It slices readily and is ideal in recipes. Reblochon _ Made in the French Alps, the name derives from the term for the second-milking of the day, the cow’s milk, which is used to make this cheese. A small, flat disk, it is mild in flavor. Royaldieue _ Similar in texture and body to Port Salut but has a higher butter fat content. The crust is not edible. St. Nectaire _ Again, a cousin to Port Salut but its inedible crust is darkish brown. St. Paulin _ Another look-alike to Port Salut, in shape and flavor, but it does not have an orange crust. This cheese is also a creation of the Trappist monks. These cheeses are much prized by connoisseurs and almost every region of France has its own special goat’s milk cheese. They are found in many sizes and shapes, such as 3- to 8-inch round patties, log-shaped, drum-shaped, pyramids, rounds, loaves, etc. Textures vary from soft, but firm, somewhat like cream cheese, to extremely hard. Chevres make excellent dessert cheeses, served with bread and fruit. The French wines recommended to drink with these unique cheeses are modest white wines or roses. Provence _ It is wrapped in chest nut leaves and tied with raffia. Capricette _ This is a fresh goat cheese, with a low fat content and a delightful tangy flavor. Available in 4-oz. plastic cups. Chabichou _ Small cone-shaped, soft goat cheese, which is ideal for dessert. It is made in the Poitou region, and its flavor varies from fruity to sharp depending on its age. Chevre au Poivre aux Herbes _ These patty-shaped cheeses are sprinkled with pepper, fennel and rosemary. All are excellent as hors d’oeuvre. Chevrotin _ A popular cheese of this variety. It has a fat content of 45 per cent, mild aroma, with a creamy texture and nutty flavor. Montrachet _ This is made in the province of Burgundy, and always comes in the shape of a log. Mild and creamy in flavor with a rind that may or may not be dusted with vine wood ash. Good keeping quality. Pyramide _ Sometimes called Valen ay, this is, as its name implies a pyramid-shaped cheese. It has a mild nutty flavor and also its edible rind may or may not be dusted with wood ash. St. Marcellin _ Originally this cheese, from the Is re Valley, was made strictly from goat’s milk. Today, it is more often a combination of cow and goat. It is a soft round disk, with a mild slightly acid flavor. Sainte Maure _ A soft-ripened goat cheese, log-shaped, with a thin edible crust and a mild flavor which becomes more pronounced as it ages. It is sometimes called Tonnelets. These cheeses have a blue vein marbling mostly developed by natural fermentation processes, sometimes by inoculation to start or hasten ripening, and maturing. The term persill , which is often applied to these cheeses, has nothing to do with parsley. Rather it refers to the blue- green veining which resembles parsley. These cheeses have a tangy flavor, some more than others, are usually semi-soft, often crumbly, especially when cold. Natural blue cheeses are produced in many areas of France and are named after their region or origin. Most blue-veined cheeses are marvelous with fruit, crusty bread or unsalted crackers, either for snacks, hors d’oeuvre or as a dessert course. Their robust flavor calls for a full-bodied French red wine. In the U.S. these cheeses are widely used in salads and salad dressings. Bleu d’Auvergne _ From the mountains of the rustic region of the Auvergne, this cheese is made from cow’s milk. It has a rich, sharp flavor. Bleu de Bresse _ Also made from cow’s milk in the region of Bresse, this cheese is available either in cylinders or long loaves. It has a mild-ish flavor for this type of cheese. Pipo Creme _ This cheese, available in six-pound rolls, has a very distinct flavor, slices easily as it does not crumble. The thin crust is edible. Roquefort _ The “King” of cheeses as it is known throughout the world. Made exclusively from ewe’s milk in the south of France and aged and ripened in the limestone caves of the small village of Roquefort. It is unique unlike any other cheese in flavor and texture. Authentic Roquefort can be easily identified by the red sheep emblem on the label. These cheeses are used very often in gratin dishes, as an ingredient in many recipes, and are very popular in sandwiches, or as snacks. Usually they have many “eyes”, the size of which is helpful in identifying the various kinds. Beaumont _ A specialty of the Savoie region of France, this cheese has a distinct nutty flavor. It has a tannish crust which is not edible. Inside, the ivory colored cheese has many tiny “eyes” arranged close together. Emmental Francais _ Identified by its eyes which are relatively large. This cheese has a nut-like tang that adds zest to such dishes as quiches, fondues and sauces. Mimolette _ Made in the north of France from cow’s milk, it is about the size and shape of Edam. In texture and flavor, however, it is more similar to cheddar. Out side it is orange and inside a bright yellow. 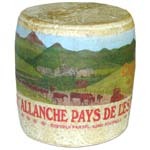 Tomme des Pyrenees _ A cheese from France’s Basque country, it is a large round cow’s milk cheese, with an inedible black rind. Tomme de Savoie _ From the Alpine region, this cheese is made from cow’s milk and has a low fat content. It is firm, subtly flavored and comes in a flat, round disk which weighs about four to six pounds. Cantal _ A native of the Auvergne region, this is one of France’s oldest and most famous cheeses. Has a piquant flavor but its hard crust is not edible. It is low in fat and high in protein making it an excellent choice for dieters. Fine for cooking or as a simple table cheese with bread and red wine. A wheel may weigh as much as 100 pounds. Most of France’s process cheeses are a blend with a creme de Gruyere as as base. They may have a firm, heavy texture, or may be soft, smooth and spreadable. Beau Pasteur _ This cheese has a mild, distinct flavor, a creamy buttery texture and no crust. It is available in a three-pound round. Fondu au Raisin _ A semi-soft cheese with a distinctive grape flavor imparted by its rind (inedible) of grape seeds, called “marc” the remains from the pressed grapes. Gourmandise _ Similar to Beau Pasteur with either a cherry or walnut flavor. A party and dessert favorite. La Grappe _ Another name for the cheese called Fondu au Raisin. La Vache Qui Rit _ Which means “laughing cow”, a picture of which appears on the label. This has become an American favorite. It is available in cocktail-size pieces or in packages of individual wedge-shaped portions. Nec Plus Ultra _ Similar in texture and quality to Gourmandise. It is served in the same manner, and also is available in cherry or walnut flavors. Six de Savoie La Vache Qui Rit _ Similar to La Vache Qui Rit, it is pack aged in small triangular wedges. Tomme au Marc _ Same as Fondu au Raisin.